Learn how to do the 2A trick Windshield Wipers, a trick involving synchronized regenerations which takes place in same time on wall plane. Just like that. 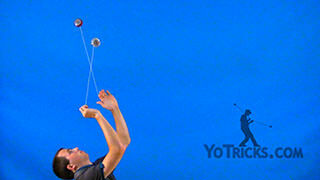 This trick is a repeater trick, and it is also being done in same time on wall plane. If you do not know what those last two terms mean, you are going to want to check our terminology videos, the first one being Rhythm and Tempo, and the second one being Planes. 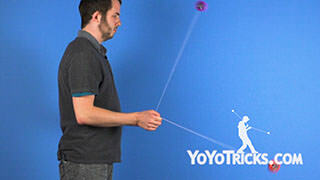 While you are at it, you may want to check out our trick The Regen, because this is what this trick is based off of. So what you are going to do is you are just going to throw to one side, let it swing across, and then you are going to perform a regen on the other side and swing it back over to the other side and continue repeating. 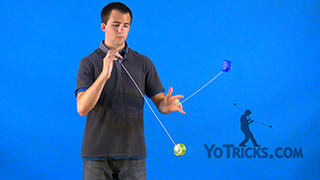 Also when practicing this trick, make sure that the yoyo stays completely straight up and down throughout the entire course of the trick. 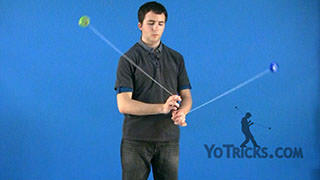 This will help with getting more repetitions in and being more consistent with the trick overall. But it is definitely the hardest part of Windshield Wipers, so we have plenty of tips and help in order to practice this technique. The first thing is when you are swinging the yoyo from side to side, is you will notice that I am turning my body with the way that the yoyo rocks. 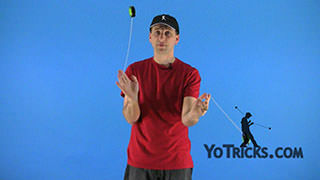 Even though the trick is being done on wall plane, I am actually facing completely straight on with the yoyo during the regen portion on each side of the trick. The second thing is when you are swinging it across, is you want to make sure that when the yoyo reaches its peak on each side, that is matches up with your shoulder height. 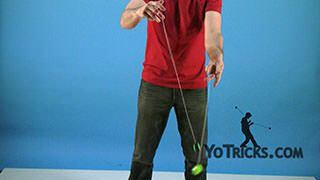 The usual tendency when starting to learn this trick is to swing the yoyo too far down towards the ground and it can be really hard to get something consistent going down there. 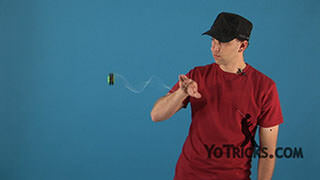 The third thing is when the yoyo is reaching its peak, is there is a certain timing that you want to have when the yoyo comes back to your hand. 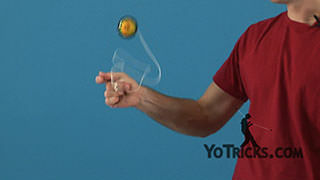 It is after it reaches its peak, you are going to let the yoyo swing down just a little bit, and then you are going to pull on it and that will allow the yoyo to get underneath your hand and come across. 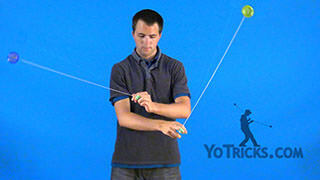 That way the yoyo stays straight up and down a lot more consistently. 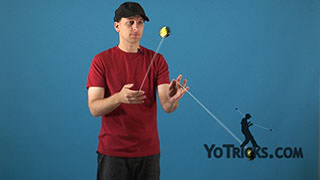 As you hone down the trick, and you are able to do it many times in a row, you are going to notice some changes in the string, and how the yoyo is responding over time. With two step looping tricks, most of the time, the string tension or the tightness of the string is not going to change over the course of the trick. Surprisingly in windshield wipers, the string tension is going to change. 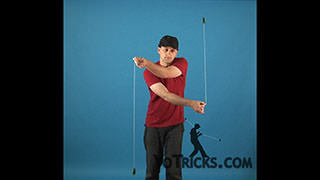 When you are doing it with your right hand, you will notice that the string is getting tighter over time. With the left hand, it is getting looser over time. So you just are going to want to make sure that when you are practicing it, that you check on it every once in a while. 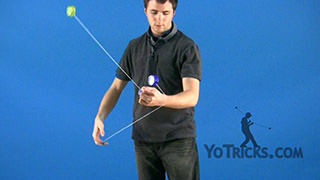 Make sure that the left yoyo is not going to fall off the string and fall away, and that the right hand yoyo is not going to have the string so tight that it is not going to respond anymore. 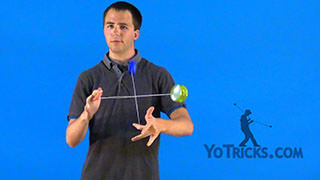 When practicing the trick two handed, you want to make sure that during the regen portion of the trick, that the yoyos are lined up with their respective shoulders and not with the other side. 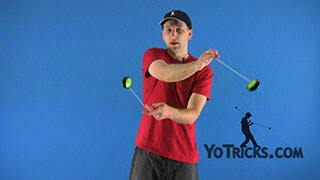 In order to accomplish this you need to make sure that on the downswing, the outside yoyo is in front leading the way. 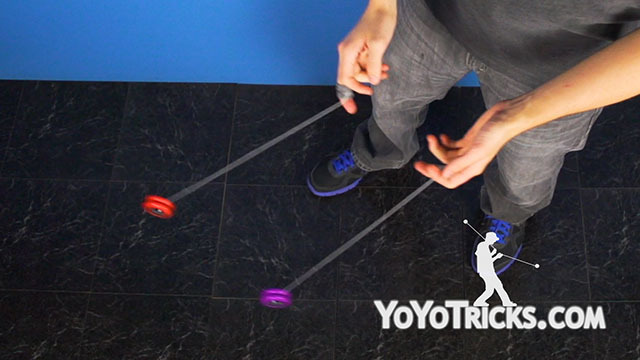 When you are facing the left, your right hand is going to be the outside, and when you are facing the right, your left hand yoyo is going to be leading on the outside. 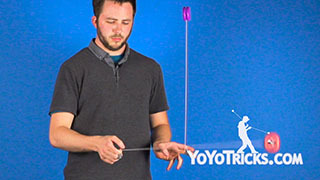 So, on the downswing of each and every windshield wiper, you want to position your hands in such a way so that the outside yoyo is leading the way in front of the other yoyo and crossing over to the other side. 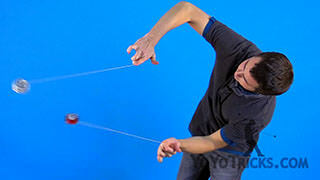 If you do not do this, it will end up that the strings will tangle, or you will have your arms crossed on the other side. One last thing. When practicing windshield wipers, it may be tempting to get a little excited and to try to do as many repetitions as you can, and see how far you can get, but you just want to be disciplined like in any 2A trick. Just practice one repetition at a time and keep working up in baby steps. So when you are starting out two handed windshield wipers, just make sure that you start from the right, do one regen, and catch on the right again. 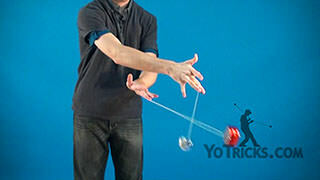 And after you learn that, then start from the left and then learn the regen on the right, and catch on the left again. After you are able to do both sides of that comfortably in one repetition then you can think about doing two repetitions where you start from the right, and two repetitions where you start from the left. After you get comfortable with that, you can do three, four, five, and so on and keep working your way up until you get ten or twelve, and then after that try to think about doing it indefinitely. And that is Windshield Wipers.